500 gr cuttlefish, 8 fresh prawns, 4 fresh crawfish, 8 mussels, 8 clams, 1 tablespoon of paprika, 2 dcl olive oil, 2 ripe tomatoes, 400 gr rice, 1 onion, green beans, peas and 1.25 litre fish broth. Clean and dice the cuttlefish in cubes of about 2 cm. Heat the oil and when it is hot add the prawns and crawfish. Set aside. Sautée the cuttlefish in the same oil; when it starts to change colour add the tomatoes and onion, very finely chopped. Once we have lightly fried these ingredients, add the vegetables and rice, paprika and mix well. Add the boiling broth and let boil on a high flame for around 10 minutes. Add the prawns, crawfish, clams and mussels and cook for another 5 minutes until the broth is evaporated. Let stand for a few minutes. Chardonnay grapes where harvested in mid-August, from different plots of the denomination of origin Binissalem. The Prensal grapes were picked after September 10th in the area of Santa María del Camí. The whole harvest was done by hand. The extraction of the must is done by pneumatic press, limiting in this way the pressure at which the flower must is obtained. After a static debourbage during some 48 hours, the fermentation of the must begins at a controlled temperature not exceeding 17ºC. Yellow colour with greenish reflections. Clean and bright appearance. 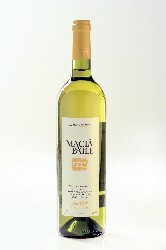 Intense aroma of a primary character, with distinct tones of peach, pear, grapefruit, apple, exotic fruits, fennel. Intense, unctuous, fresh and balanced aroma at the palate. We recommend to store in a cool place isolated from noise and bad odours. Serve at a minimum temperature of 8ºC to bring out its sensory features. 2.5 kg lobster, 1 onion, 4 ripe tomatoes, 2 cloves of garlic, 2 dcl olive oil, 1 cup of brandy, parsley, salt, 50 gr chopped almond, fish broth and 1 teaspoon paprika. Cut the lobster in thick slices and season. 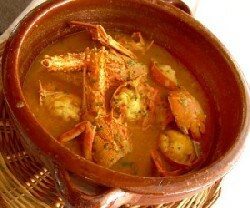 In an earthenware pot, add oil and prepare a sofrito with the tomatoes and onion. Once the tomato is well reduced sauté the lobster and flambée with brandy. Add the paprika. Cover with fish broth, add chopped garlic, parsley and almond. Cook for 10 minutes and let stand a few minutes. In our search for the distinctive character of the Prensal Blanc grape we painstakingly control the harvesting date to achieve an ideal ageing that allows for the maximum expression of the great aromatic capability it has. We combine the Prensal with a 15% of Chardonnay to compensate for the lack of acidity, and we obtain the aromatic complexity of Prensal. Fermenting at low temperatures (~14º C) for several months we avoid generating volatile aromas and we preserve the subtlety of the varietals. Malolactic fermentation on a small portion of the wine will allow us to achieve further complexity. Thus, finally, we find a complete wine, with a perfect balance between alcohol content, acidity and bitterness. We perceive very diverse aromas, from fresh fruit and white flowers to honey and peach. As well as some almost imperceptible milky tones which, far from taking away from the body, they give it softness and a round finish.